America won the Space Race. We got to the moon before anyone else did. But back in 1961, that outcome didn't seem so clear. 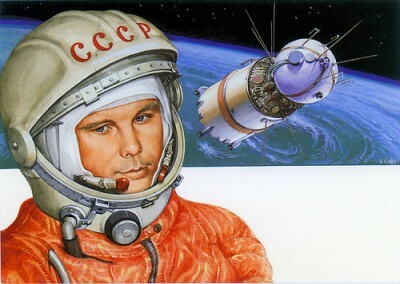 That was especially true on April 12 of that year when a Soviet cosmonaut became the first person to orbit the Earth. His name was Yuri Gagarin. And today is his birthday. He would have been 82. Gagarin joined the Soviet Air Force in 1955. Four years later he was training to become a cosmonaut. On April 12, 1961 in spacecraft called Vostok 1 Gagarin circled the planet at a speed of 27,400 kilometers per hour. The flight lasted 108 minutes. Unlike the American space flights that followed, Gagarin didn't land back on Earth in his spacecraft. He ejected from Vostok and parachuted to the ground. Godless communist or not, that was pretty bitchen! 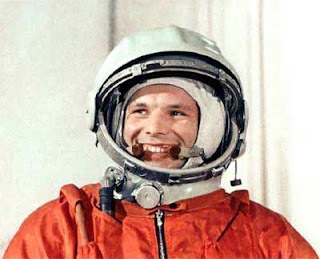 Gagarin was killed in a plane crash on March 27, 1968 -- more than a year before the U.S. moon landing. Gagarin never got to take a second trip to space. Astronauts Neil Armstrong and Buzz Aldrin left medals on the moon honoring Gagarin and cosmonaut Vladimir Komarov, who also had been killed in a plane crash. A crater on the far side of the moon was named in honor of Gagarin. Back when I was in college, some older friends of mine in El Paso honored Gagarin by inventing a drink named after him. I don't remember what was in it. Vodka I presume. A couple of bartenders down in Juarez would serve it when you asked. In Russia, he was honored with this song. (Sung by Eduard Labkovskiy in 1975). Gagarin first turn around the Earth. He smile his whole universe presented. It is a new road has opened for us. Climb into outer space any new ground. With the crew will go to Mercury and Mars. He opened a new road for us. Across the Solar System to walk someday. Astronauts, scientists will deliver at Pluto. For the future they committed feat. I have no idea what "For the future they committed feat" means.